Where's the modern musical notation? Where can I find translations? Are you interested in collaborating on other projects related to the Cantigas de Santa Maria? Can I link to your site from my own website? Can I reference your work in an academic paper? Can I copy the contents of your site to WikiSource / my own website / my forthcoming book etc? The full texts of the Cantigas de Santa Maria have been on the web for ages (e.g. Portuguese WikiSource). Why can't I just use them? Some of your syllable breaks look weird. Why write que•r' eu in CSM 1:1 and not quer' eu? Why doesn't X... or Y... or Z work in my browser? Can I play the Cantigas on my crumhorn? 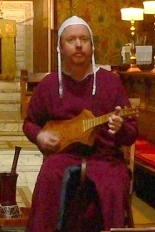 Andrew playing citole with the group Gaïta in their No Miracle Too Small concert of Cantigas de Santa Maria, Edinburgh, September 2009. The author of this site is Andrew Casson. I'm a professional software engineer, a performing musician specializing in the medieval repertoire, and a keen amateur philologist. So when I had both the idea and the opportunity to create this project around the Cantigas de Santa Maria, it pushed all my buttons, so to speak. Languages, and their history, have fascinated me for as long as I can remember, probably going back to when I was five years old, and was taught to count to ten in French (in an appallingly bad accent) by one of the boys from the “big school” on the school bus. As a (rather long-term) consequence, I very nearly embarked on a Ph.D. in computer-assisted historical linguistics at the University of Sussex, when fate intervened and I ended up with a job at AIAI in the University of Edinburgh in late 1990. My academic and commercial software engineering career from that point—which ended up in the role of Principal Engineer developing pre-press applications for a well-known Yellow Pages publisher—probably won't be of much interest to readers of this website. What Edinburgh really did for me was introduce me to medieval and renaissance music, initially via the route of historical re-enactment activities, but eventually in a more formal capacity as a member of Chris Elmes' group Gaïta. These days my personal performance repertoire covers a wide range of European music from the ninth to the sixteenth centuries, but at its core are the early instrumental dances (saltarelli, istampitte and estampies), French, Italian and English Renaissance dances from the 15th and 16th centuries and, of course, the 13th century Cantigas de Santa Maria. Having left Edinburgh in 2010, I lived for four-and-a-half years in the green and cloudy north of Gran Canaria, where I made the most of the extended periods between paid software contracts to work full-time on this website. As of February 2015, I'm now back in the UK and based in the beautiful historic town of Whitby, birthplace of English poetry and song. Whatever my location, I've been very happy to be able to continue my collaboration with Chris Elmes in bringing the Cantigas de Santa Maria to a wider range of performers. Two answers, one practical, one more philosophical. The first is simply that, when I started, no full edition of the Cantigas de Santa Maria existed that reconciled all of the text with all of the music into one consistent package. In particular, it is quite clear that Higinio Anglés, in what is still regarded by many as the standard (if not definitive) transcription of the music into modern notation, paid little or no regard to the lyrics beyond the first stanza of each cantiga; and it is equally true that Walter Mettmann, in editing the text according to purely poetic criteria, had no detectable interest in the music. So I saw a gap, and decided that it should be filled. To my knowledge, I am still the only person to have undertaken and finished this task (ongoing revisions notwithstanding!) and I am not aware of any similar projects that are anywhere near completion, either within academic institutions or conducted independently. The second answer is that, whilst the Cantigas have nonetheless been the subject of much detailed and focused musicological, philological and paleographical study, it's very easy to lose track of the fact that they weren't written to be studied, but to be sung. So whilst I do naturally hope that some academic merit will be recognized in the work that I've done, it's far more important to me that the Cantigas be performed, recorded and enjoyed all the more as a result. Q. Where's the modern musical notation? First of all, I would encourage all performers of medieval music to familiarize themselves with the original square notation. It's ‘the real McCoy’, and if you really understand it well, it will grant you a freedom of interpretation that simply cannot be matched by any translation into a modern score. That said, I have nonetheless tried to ensure that the materials on this website are compatible with the edition of the Cantiga music produced by Chris Elmes and published by Gaïta Medieval Music. This four-volume set is probably the only full edition of the music available at the moment which is both reasonably priced and easily acquired, and you can order it from Gaïta's publications page. Other complete editions of the Cantiga music exist, of course, but you'll be very lucky indeed to find them for sale in a bookshop, or even on the web: you'll probably have to go to a large academic library. The one you are most likely to come across is La música de las Cantigas de Santa María del Rey Alfonso El Sabio by Higinio Anglés (4 volumes, Barcelona 1943–1964), which was unchallenged for a long time as the standard reference for performers, partly on its own merit but also largely through the lack of any alternative. There is also the more recent but less well-known work Cantigas de Santa María: nueva transcripción integral de su música según la métrica latina by Roberto Pla (Madrid, 2001). Real Academia Española, Madrid 1922. Reprinted 1989. Translated and abridged as Music in Ancient Arabia and Spain, Stanford University Press, 1929. —295 cantigas including all of [To] and a selection from [E]. The English translation reproduces a much smaller subset of just 43 of these. For the 29 from [To], the printed number is one more than the number actually assigned in the manuscript (because Ribera, for reasons best known to the illustrious Arabist himself, decided to call the Prologue number 1 and count from there), whilst the 14 from [E] are infuriatingly difficult to identify since the numbering is entirely Ribera's own (apparently continuing the sequence where the [To] transcriptions left off) and there are neither incipits nor underlaid lyrics. University College Dublin Press, Dublin, 2000. —Just the 42 cantigas de loor, plus Prologue B and the Petiçon. PUV Publicacions, Universitat de València, 2005. —Just the cantigas from [To], but transcribed by reference to [E]. All three of these have been subject to harsh criticism, in particular Ribera by Anglés, Cunningham by David Wulstan¹ and López by Manuel Pedro Ferreira.² Without launching into my own reviews of these works, which I don't feel qualified to write anyway, I will just say that for performers (as opposed to academics), Cunningham's work is valuable and worth acquiring for alternative reference, but those of Ribera and López are not. Always remember though that there is no modern transcription of the Cantigas in existence that can be described as ‘definitive’, and there possibly never will be. Reviews of Music in Music and Letters, Volume 83 (1), Oxford University Press, Feb 1st 2002. Q. Where can I find translations? For a brief narrative summary in English of most of the Cantigas, you can now consult the Oxford CSM Database: just click on a cantiga in the Poems tab and you'll find the summary there, along with other useful information, although not the full original text. As of August 2013, however, there are no summaries of the Cantigas de Loor (numbers 10, 20, 30 and so on), presumably because these don't have stories as such. This was out of print and very difficult to acquire at a sensible price for many years, but it was at last reissued in late 2012. See the publisher's page for ordering details (click on the ‘How to Purchase’ link). Note that the book is actually ‘print on demand’ and may take some time to be delivered after ordering—4½ months in my case, but you might be luckier. but this contains only the 200 or so Cantigas found in the [T] manuscript. I don't know for certain that this is out of print, but I strongly suspect so; please contact me if you know otherwise. However, anybody with a working knowledge of modern Portuguese, Galician or Spanish should be able to make reasonable sense of the language of the Cantigas, and this will improve over time, of course. I would just like to finish off this answer with a plea though: don't perform anything that you don't understand! Not only will knowing what you're singing about improve the delivery immeasurably, but it's always better to be in a position to judge the appropriateness of the content for your audience, even if you think they're not going to know any better. It's an unavoidable fact, for instance, that many of the Cantigas are sprinkled with the kind of casual anti-Semitic and anti-Islamic sentiment that was typical of the medieval period. If you're concerned about this, do your best to find translations of what you're planning to perform, and make sure that you at least put it into the appropriate historical context for your audience. Q. Are you interested in collaborating on other projects related to the Cantigas de Santa Maria? It would depend on what the project involved, of course, but I would certainly be interested to know more, whether you're a performer, an academic, or indeed anybody else with a genuine interest in the Cantigas. Email me if you have a proposal. Q. Can I link to your site from my own website? A. Yes, please do. And tell your friends! Q. Can I reference your work in an academic paper? Casson, Andrew D. "Cantigas de Santa Maria for Singers". Web, 21st June 2011. Substitute the date that you see in the page footer under ‘Database built’ when you access the site, as this is the safest determiner of the current site contents, which may change after you reference it. I would also appreciate it if you would drop me a note when you cite me. Thank you. Q. Can I copy the contents of your site to WikiSource / my own website / my forthcoming book etc? Sorry, but no, you can't. You may not republish my work in any form whatsoever. Q. The full texts of the Cantigas de Santa Maria have been on the web for ages (e.g. Portuguese WikiSource). Why can't I just use them? Q. Some of your syllable breaks look weird. Why write que•r' eu in CSM 1:1 and not quer' eu? it is important to keep the syllables mo and se, so that the s is syllable-initial and intervocalic, and therefore voiced, resulting in [fre.mo.ze]. If the syllables were broken as mos and e, this would imply [fre.mos.e], which is wrong. Q. Why doesn't X... or Y... or Z work in my browser? Please understand though that this site is a labour of love, for which nobody pays me, and I'd much rather be working on interesting new functionality than compatibility tweaks for ancient browsers. So I'd just ask that you do whatever you can to ensure that you're using a recent version of a standards-compatible browser, and see if that solves your problem, before submitting any bug reports. If, on the other hand, you're stuck with IE6 on a computer you're unable to upgrade, then I'm afraid the best I can do is send my condolences. Q. Can I play the Cantigas on my crumhorn? A. Definitely not; that would be silly. Crumhorns were, to quote an Early Musician friend of mine, “popular for about five minutes in the 16th century”. If you like musical anachronisms though, you might like to try playing CSM 159 on the electric guitar, which rocks.